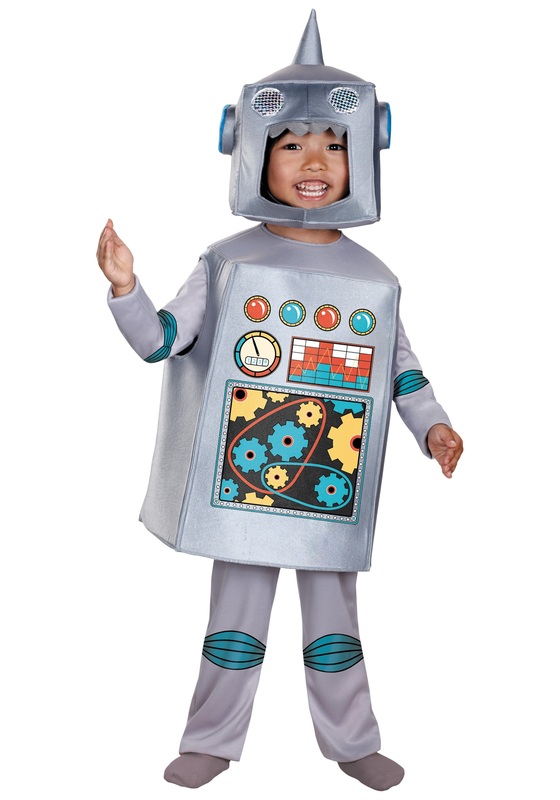 This Toddlers Retro Robot Costume is perfect for the budding computer scientist who loves to figure out how things work! It's a gray poly interlock knit jumpsuit with an elastic back waistband and Velcro™ tab closures at center back. It has blue mechanical joints screen-printed on the elbows and knees. The foam tabard has an open bottom for legs, two holes for arms and a hole for a head, and a center-back Velcro™ tab closure. The front has colorful gears, lights and buttons screen-printed on it. The box-shaped polyfoam headpiece has an inner hood of interlock; the space between the outer shell and inner hood can be stuffed with tissue if desired, to fill it out. It fastens with Velcro™ under the chin. This costume comes with all the bells and whistles!